Draymond Green is doing everything for the Warriors, but the Cavaliers aren't getting much out of Kevin Love. Everything could have been different if the summer of 2014 went down another way. The Warriors have now beaten the Cavaliers seven straight times. They lead 2–0 in the NBA Finals, and they won those games by a combined 48 points. It's a massacre. If it were boxing, the ref would've stopped the fight after the third quarter last night. "We've got to get back to the film," LeBron James said at the podium afterward. "We all have to figure out ways we can help the team be successful. It's hard for me to kind of pinpoint what's not working." What's "not working" for Cleveland, technically speaking, is everything. Kyrie Irving has been off (shooting 33% from the field and miserable on defense), LeBron has been underwhelming and the defense has been shockingly overmatched trying to keep up with the Warriors. Tristan Thompson looks overpaid, Iman Shumpert looks irrelevant, and J.R. Smith is either too drunk to contribute or not drunk enough. Either way, his Finals legend continues, and the Cavs have had no answers. But if anyone's looking to pinpoint one factor to explain how this series has gotten so out of hand, it has to be the difference between Kevin Love and Draymond Green. The matchup in Game 2 was as lopsided as it's ever been. Draymond had 28 points, seven rebounds and five assists, all while anchoring a swarming defense that held the Cavs to 35% shooting, including 21% from three. Meanwhile, Love was 2-of-7 for five points in 21 minutes, he was exploited often on defense, and he left the game in the third quarter with concussion symptoms. Game 2 was an extreme example of their differences—Draymond doesn't typically hit five threes, and Love's early exit ruined him statistically—but it's indicative of how the Cavs and Warriors stories have played out over the past two years. One side of this story has been nothing but frustrating complications, and the other has been nothing but pleasant surprises. "Draymond does everything for us," Steve Kerr said after Game 2. "He defends. When we play our small lineup, he's our rim protector. It's a tough job in this series because he has to guard Kevin Love who is usually spaced out at the three-point line. So he's got to pick his spots, how to help and try not to stray too far away from Love and still be able to help out on LeBron." Watching things get out of hand in the first half, I couldn't stop thinking back to the summer of 2014. Draymond Green wasn't even a starter on the Warriors at that point. There's no need to rehash his entire rise from second-round obscurity to fur coats at All-Star Weekend—Lee Jenkins does a nice job telling that story here—but after a first–round loss to the Clippers, nobody was talking about the Warriors as title contenders, mostly because "Draymond Green, All-Star" didn't exist. 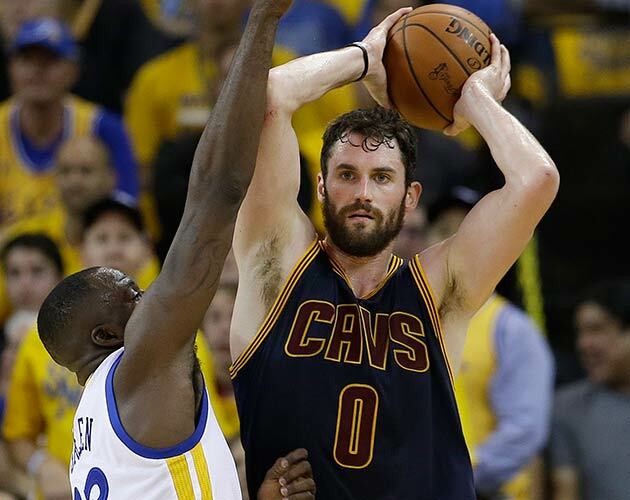 This is why the Warriors were trying to trade for Kevin Love. Whether they ever seriously offered Klay Thompson is up for debate, but had Love wound up in Golden State, Draymond's story certainly goes differently. Instead, the deal fell through. That same summer, LeBron James went back to Cleveland. It was both a heartwarming story and something more impressive. This was a superstar at the peak of his powers who was thinking two moves ahead. While the Heat dynasty appeared to be on its last legs, LeBron saw a Cavs team with one young superstar (Kyrie), and the chance for another. He left, and it was in large part because the Cavs' No. 1 pick gave Cleveland the chance to trade for Love, creating a superteam that was younger and more explosive than what he had in Miami. What LeBron didn't account for was Draymond. It's not simply that David Lee got hurt and Green slid into the starting lineup and helped the Warriors hit another level on both offense and defense. That alone created a monster the Cavs never planned on dealing with, but Draymond's rise is also indicative of changing NBA values that weren't entirely clear when the Cavs were assembled in 2014. Over the past two years, the best teams in the league (Spurs, Warriors, LeBron's Heat) have thrived by creating and exploiting bad matchups on offense, and playing flawless team defense on the other end. Players who can help on both ends are more valuable than ever. "You can't guard LeBron with one guy," Green said after Game 2. "Our team has done a great job of helping each other out, but also while helping each other out, not just giving up threes. You know, flying around and trying to contest their three-point shots as well. So if we continue to play like that on the defensive end where everybody's helping each other, we're really tough to beat." Guarding multiple positions, holding up on switches, protecting the rim... That's what Golden State has mastered as a team, and nobody personifies it better than Draymond. The flipside of the story is Love. He's been uneven for the past two years. He's battled injuries, his strengths have faded in the Cavs' system and his weaknesses have been exposed. He was great against the East for the past month. Now he's lost on defense and he's not consistent enough to make a difference on offense. He personifies all the problems that the Cavs have as a team in this series. So many of the Cavs' problems could've belonged to the Warriors had a few things gone differently with Minnesota two years ago. Draymond might still be stuck on the bench, and Klay Thompson's two-way genius would be wasted playing next to Zach LaVine. Nobody in Golden State knew that the final piece of the title team had been sitting on the bench, the same way nobody on the Cavs could've predicted the LeBron-Love-Kyrie nucleus would be looking like the Buffalo Bills two years later, but here we are. What's great about the NBA Playoffs is watching history unfold in real time. What's funny about these Finals is that we're watching the Warriors finish the most successful season ever, but not before remembering how much luck plays into history.